There is a robust literature on designing living environments to better fit the needs of people with autism. A cheat sheet of design techniques is based on the literature discussed below and on the experience of Autism Housing Pathways members. Ahrentzen and Steele: “Advancing Full Spectrum Housing: Design for Adults with Autism Spectrum Disorder” is a companion study to “Opening Doors”, discussed on the “Best practices” page. It outlines a set of design goals with companion design guidelines. Andrew Brand: This handbook of design guidelines was the outcome of a project, “Living in the community”, that showed better outcomes in settings designed for autistic residence. Four design themes are identified. Braddock and Rowell: “Making homes that work” provides a template for families to assess the needs of an individual and modifying the home to meet those needs. Housing exists in a social context; individuals need supports that translate expectations of the environment, such as the “hidden curriculum” of being a housemate, a neighbor, and a tenant, including a clearly understood version of the lease. These examples are just that. They do not apply to all people with autism, but they are sufficiently common that they need to be accounted for in creating autism-friendly housing. The 2011-2012 AHP housing survey indicated there were a number of modifications that were deemed helpful or necessary by a significant number of respondents, including over 50% who would benefit from sound-proof bedrooms, durable construction, and a fenced in yard, and over 20% who would benefit from unbreakable glass, and floor drains in bathrooms. Design that anticipates these needs will result in residents preserving tenancy, fewer stress-induced meltdowns, lower repair bills, and less need for costly support staff to facilitate interaction with the environment. In the last ten years, a robust literature on autism-friendly design has developed. The goal is to accommodate the characteristics of autism in designing housing, with the goal of improving residents’ quality of life. We will look at three examples of the literature. The first two are aimed at elucidating design principles, while the third takes a more practical approach, providing a template for identifying specific modifications to address individual needs. 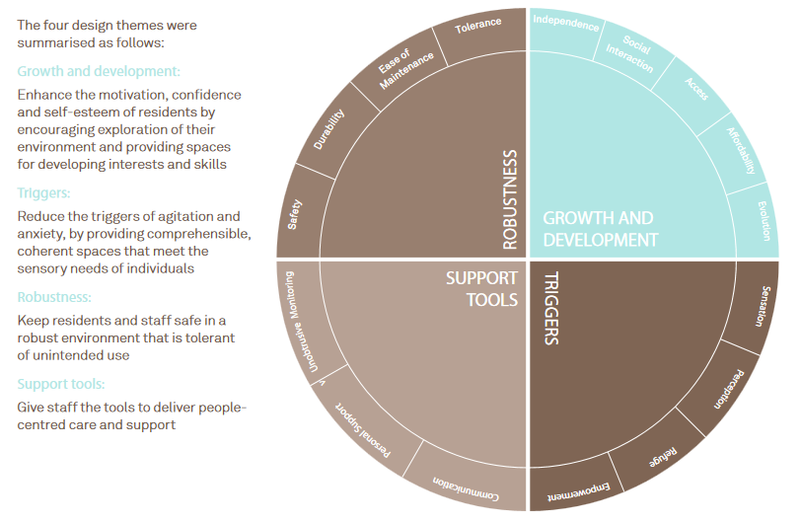 Autism Housing Pathways has produced a summary presentation on autism-friendly design, and a cheat sheet of design techniques, based on the literature discussed below and on the experience of its members. Ensure accessibility and support in the surrounding neighborhood. 16 design guidelines, referencing the goals, address: neighborhood; floor plan strategies; outdoor spaces; living/community rooms; kitchens; hallways, stairs, and ramps; bedrooms; sensory rooms; bathrooms; laundry room; technology; visual cues; ventilation; lighting; materials; acoustics; appliances and fixtures. Brand then produced a design guide, divided into five “layers”: planning; massing and layout; mechanical and electrical; furniture, fabric, and finishes; fixtures and fittings. They also provide strategies to cope with the specific challenges of elopement, self-injury and seizures, property damage, aggression, and neighbor relations. Autism has sometimes been described as involving “context-blindness”, or difficulty with processing the context surrounding a situation. Like everything else, housing exists in a context. Physical design can help provide clues to that context, but additional supports are frequently needed to translate the social context of the housing environment. These can include explicit explanations of what is expected of a tenant, a neighbor, and a housemate. Clear strategies for addressing conflict need to be provided. Similarly, a readily understood version of the lease can be an important tool, in addition to guides to maintaining tenancy and receiving reasonable accommodations for disability. While many of these tools are not yet commonly available, a few resources are out there, including “Keep Your Housing! A Guide to Helping Massachusetts Tenants with Mental Health Issues Maintain Their Housing“, and housing workbooks that touch on the hidden curriculum. Common issues that arise that threaten tenancy are housekeeping and hoarding. A technique that worked with an individual facing eviction was having a biweekly housekeeping inspection paired with a housecleaning rubric. Similarly, hoarding has been addressed by having a clear understanding that items must be kept on shelves. Periodically, the individual would identify items to be removed, but the actual removal would be done by support staff at an agreed upon time, during which the tenant chose to be absent.